Our local weekly, VC Reporter, published a story on Matilija Dam and the Ventura River project. $965,000 of the spending bill has been designated to restore the Ventura River, long the goal of environmentalists and subject of bureaucratic infighting. “Without dam removal, we’re going to see continued decline of the steelhead population,” said Jenkin, who said efforts to get the 60-year-old dam torn down began in the 1960s, but gained momentum in the 1990s when the Surfrider Foundation took up the cause. Meanwhile, Jenkin is hoping some money from the federal economic stimulus package passed in January will be used to complete funding for a project to restore the beach at Surfer’s Point. “That one’s shovel ready,” said Jenkin, explaining that the plan to move the popular bicycle path further back from shore is an alternative to building a sea wall. I took the time on Sunday afternoon to attend the Ventura Film Fest showing of FLOW. The film takes a worldwide look at impacts to local communities when rivers are dammed and water is privatized. When faced with the reality of losing their water supply, people are given no choice but to fight for survival. It's not a pretty picture. And although this seems like a 3rd world issue, the film includes issues right here in America. Interestingly, the City of Ventura sponsored the film, hosting a Q&A with the city's water manager after the showing. Although the topic is complex, the audience asked some pertinent questions. And the answers were telling. 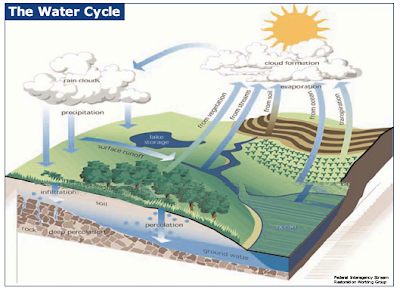 Q1 - What is the city doing to adapt to climate change and ensure a sustainable water supply in the future? Q2 - What is the city doing to address the urban runoff problem? Why are these answers significant? It is clear that future realities have not yet hit home. What would we hope the answers be? Wastewater modernization is still a long way off. Surfrider has commented formally on water/wastewater before. 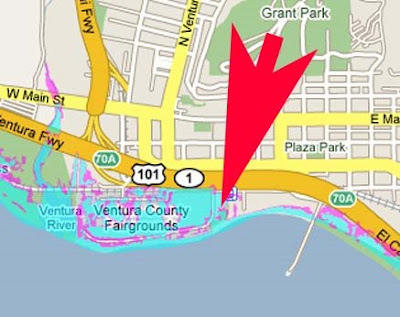 Pieces of the stormwater solution are starting to happen in Ventura. Last summer the City of Ventura formalized a 'green streets' program. If planning was in place, these types of projects could become part of the "green revolution," an economic stimulus that would employ hundreds of local people, while creating a secure future. State and Federal grants are becoming available for implementation of these strategies. But Ventura needs grants to do the planning, before these opportunities are lost. Ironically, I walked around back after the film. It seems the renovation of the historic Elks Lodge is not quite complete - water was leaking from the building, flowing through the parking lot, on its way to the ocean. Why waste water on a lawn, when you can grow food in your own garden? Don't know how? Here's a group that will come in and do it with you, and throw a party too! 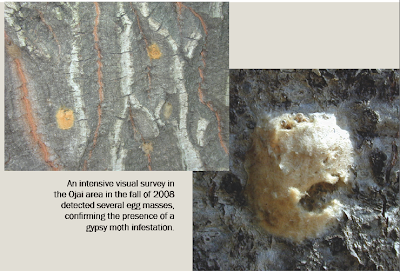 Last fall, the County Agricultural Commissioner found evidence of Gypsy Moths in the Ojai Valley. The gypsy moth is a pest that was imported into the United States in 1869 in an experiment to produce an improved silk producer. Once it escaped, it established in the New England states and has since defoliated forests, killed trees, and created great nuisances in urban areas. The greatest feeding damage is done by older caterpillars during the last two weeks of June, sometimes making it appear as if trees are stripped of leaves practically over night. ...almost everyone has some level of concern when gypsy moth caterpillars cause noticeable defoliation of trees, drop their frass (feces) on everything under the trees, or when the hairy caterpillars begin to crawl over everything in sight. At this point, people are willing to spray almost anything that they think will eliminate these caterpillars from their daily routines. So, how can people avoid coming into contact with synthetic pesticides, yet control the gypsy moth? One answer is to use products derived from a naturally occurring, soil dwelling bacterium, called Bacillus thuringiensis, or "BT" for short. This week the Agricultural Commissioner had plans to spray BT (Bacillus thuringiensis) a naturally occurring bacterium that produces a crystal protein toxin that kills the cells lining the insect gut. However, local residents, alarmed by information from Pesticide Free Ojai, have been refusing access to their property. 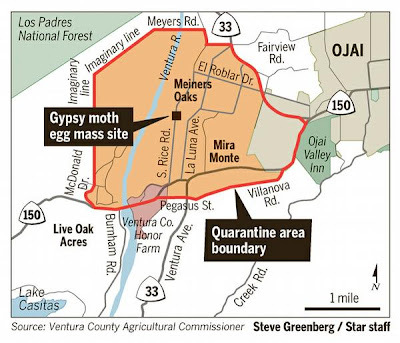 Without this timely control, before the moths hatch in the coming weeks, the Ojai Valley's precious native oaks could be devastated. And with climate change upon us, the native shade canopy in the hot arid Ojai valley could be irreplaceable. From 2006-2008, the Local Government Commission (LGC) worked with agencies and organizations to develop a watershed-based strategy for aligning local planning and stormwater management to minimize the water quality impacts of future development in Ventura County. This project, which is funded by California Water Boards, will help the county and cities therein comply with the new countywide NPDES stormwater permit, while meeting other environmental and community goals. Specifically, the project will help integrate land use pattern BMPs such as compact development with site-specific strategies referred to as Low Impact Development. An assessment of existing conditions and policies to identify needs and opportunities. A narrative explaining links between land use regulations in Ventura County and watershed health. Specific policy recommendations for aligning land use planning, community design and stormwater/watershed management programs. Technical review sheets to guide alignment of local codes and planning programs with stormwater and watershed management programs. ▼ Revise and update existing code requirements related to Stormwater Management. ▼ For the next General Plan cycle, develop broad themes of joint water/land development objectives. ▼ Elevate the role of sub-area planning as a watershed tool in General Plans and Codes. ▼ Explore use of existing planning tools to delineate sub-regional mitigation programs or RPAMPS and include in integrated water resources management plan. 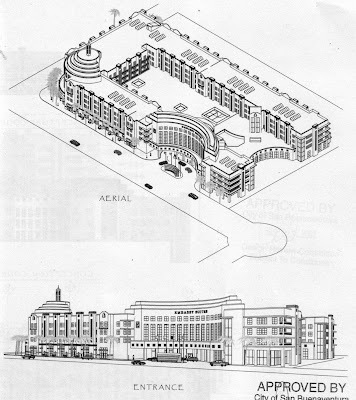 ▼ Improve design of pending capital improvements for permit compliance. ▼ Develop a first year plan for alignment, with notice of changes requiring State or Water Board action. ▼ Create a multi-disciplinary BMP team. ▼ Create a Water Mitigation Enterprise Fund. ▼ Create specialized “menu combinations” of BMPs based on the land development context and pollutants of concern. ▼ Scope out neighborhoods where pollutant/volume loading is high yet where developer driven BMP installment potential is low. ▼ Explore software to track smart growth, structural and non-structural BMPs. The Surfrider Foundation has reviewed the MND for the proposed development. 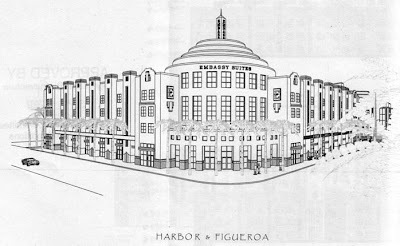 The project proposes a new four-story hotel to fill the vacant 2.74-acre parcel at the corner of Figueroa and Harbor Blvd. in Ventura. We are concerned that the MND does not adequately address impacts on coastal resources due to climate change. Although there is considerable uncertainty regarding the impacts of Climate Change, the State of California has passed AB 32, the Global Warming Solutions Act of 2006 that recognizes the threat of climate change. On March 11, 2009, the Pacific Institute released a report commissioned by the State that addresses potential impacts to the coast of California due to sea level rise as a result of climate change. Using a very conservative 1.4m increase in sea level elevation over the coming century, the study estimates that the cost of building new or upgrading existing coastal structures is estimated to be at least $14 billion (in year 2000 dollars), with an additional $1.4 billion per year in maintenance costs. The UN has predicted even greater and faster sea level rise, so this impact could me much greater. Permitting such a large development directly on the coast will increase the future need for taxpayer subsidies to protect this property. We suggest that, if this project is approved, a mitigation bank be established to provide funding for coastal maintenance. Tax revenues or a separate coastal mitigation fee should be established for all new commercial development within the future inundation zones of the California coast. Alternatively, the project should be bonded to provide funds for its removal, should that become necessary in the future. While we recognize the need for re-vitalization of the local economy, we want to ensure that the true cost of coastal development is not passed on to future generations. A public hearing on this project is scheduled for 6 PM on March 17, at the City Council Chambers at City Hall. In Casitas Municipal Water District v. United States, the Federal Circuit recently decided that the United States physically may have taken Plaintiff's water rights without just compensation by requiring the Water District to re-route water for an endangered species of trout. This decision may significantly affect the outcome of other Fifth Amendment takings cases as well as future implementation of the Endangered Species Act. This Fifth Amendment private property rights claim in Federal Claims Court against the U.S. Government for allegedly physically taking water asserted to be the private property of Casitas Municipal Water District (Ventura River) will have broad water and private property policy implications, no matter which way it eventually is decided. The suit was engendered as a result of the National Marine Fisheries Service (and CalTrout) interest in providing for fish passage across the Robles Diversion Structure (a dam, essentially) that blocked endangered southern steelhead migration upstream to spawning and rearing habitat. When the water district built a fish ladder to accommodate the anadromous steelhead, they also filed for compensation for the taking of water required to operate the fish ladder. Upon appeal to a 3-judge review panel from the original Claims Court decision, the panel majority ruled (2-1) that because water used to operate the fish ladder came from a canal labelled "Robles - Casitas Canal," the Federal Government has "taken" physical property belonging to the water district. A subsequent request to the Federal Claims Court for review en banc was rejected. The State of California holds that the water rights diversion permit issued to the water district does not confer title to the water, instead the permit gives the district simply the right to divert a specified volume of water annually. The report, The Impacts of Sea-Level Rise on the California Coast, concludes that sea-level rise will inevitably change the character of the California coast, and that adaptation strategies must be evaluated, tested, and implemented if the risks identified in the report are to be reduced or avoided. This image of the Ventura coast was taken from the interactive map on the Pacific Institute website. This shows the increased risk of coastal flooding with 1.4m sea level rise. A 1.4 meter sea‐level rise will put 480,000 people at risk of a 100‐year flood event, given today’s population. the San Francisco and Oakland airports. Approximately 1,100 miles of new or modified coastal protection structures are needed on the Pacific Coast and San Francisco By to protect against coastal flooding. The total cost of building new or upgrading existing structures is estimated at about $14 billion (in year 2000 dollars). The study also recommends a strategy for response to sea level rise, including restricting development in future innundation zones and phased abandonment of low‐ and medium‐density areas at high risk. Last year a local kid was successful in enhancing awareness about climate change and sea level rise. Alec also became the youngest person certified to present Al Gore's "Inconvenient Truth." He continues spreading his message and empowering folks all around the country.